Last Thursday, a group of us collaborated to bring you ideas on how to style your white bottoms for the summer. This week, we're back to showcase different ways to style neon. Admittedly, I don't have a ton of neon in my closet, but with pumps like these, do you really even need more? I can't take credit for this outfit. I've been wanting to wear this combination with my highlighter yellow heels and highlighter pink bag ever since I saw Bethany do it here. I'm not sure why I've never thought to pair them together before, but it works! Every time I wear these heels or carry this bag, I'm bound to get comments since they're both head turners. Yet, I'm not too shy to pair them together! They complement each other without being matchy matchy, so that's a big win for me. Neon can get super 80s to me very quickly, so I personally prefer to keep it in small doses. That's easy to do with these pumps since they're such a statement on their own. 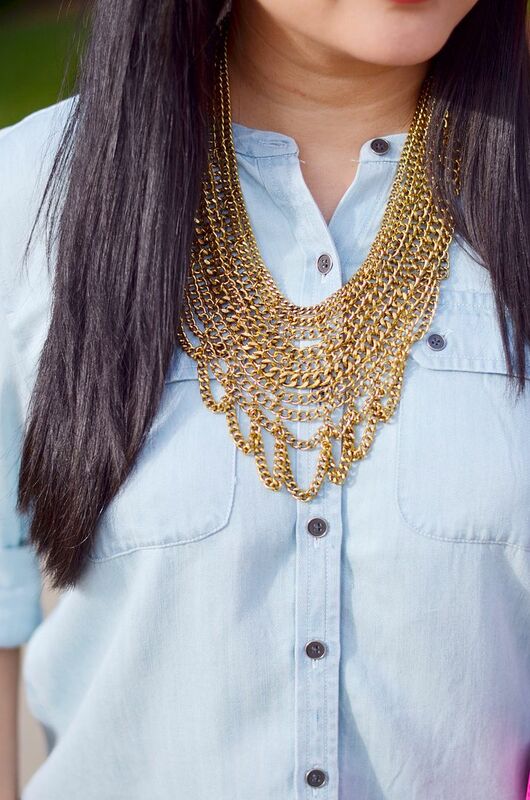 It's so fun to spice up an otherwise neutral outfit with some bright colors. These past outfits above prove that I like to let these shoes speak for themselves - I kind of forgot that I've already done denim on denim with them! I'm glad I decided to change it up with the pink bag this time! I did wear them with my neon sweatshirt that I love so much, but overall, I still think the neon in that outfit is not over-powering. I want to combine the collaboration ideas from this week and last and wear my neon heels with an all white outfit next! 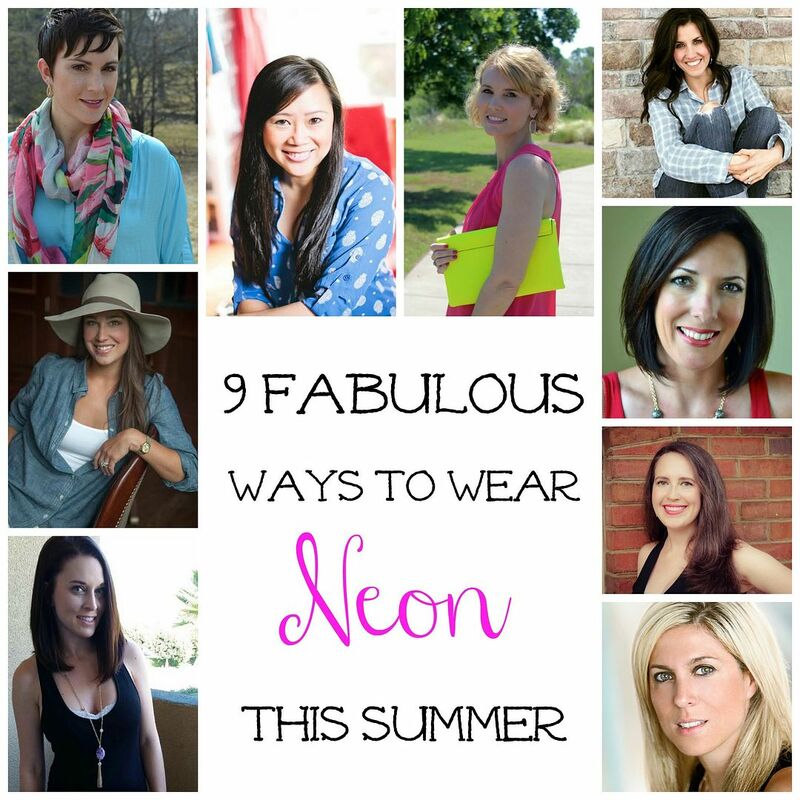 Neon is definitely not for the timid, but it's certainly more versatile than you would think! Love this look, perfect way to wear neon. Just love the pink and yellow together - perfect! 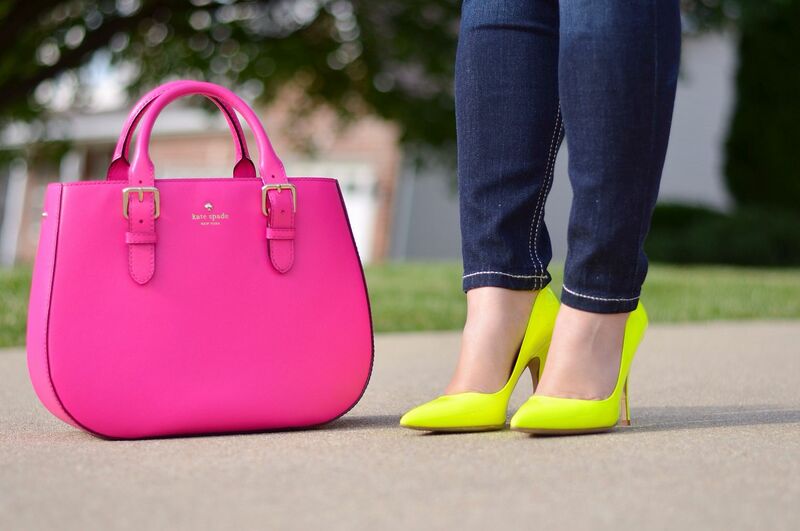 I don't own too much neon but I LOVE those shoes and that bag together. So super cute! Love the bag and the purse so cute!!! 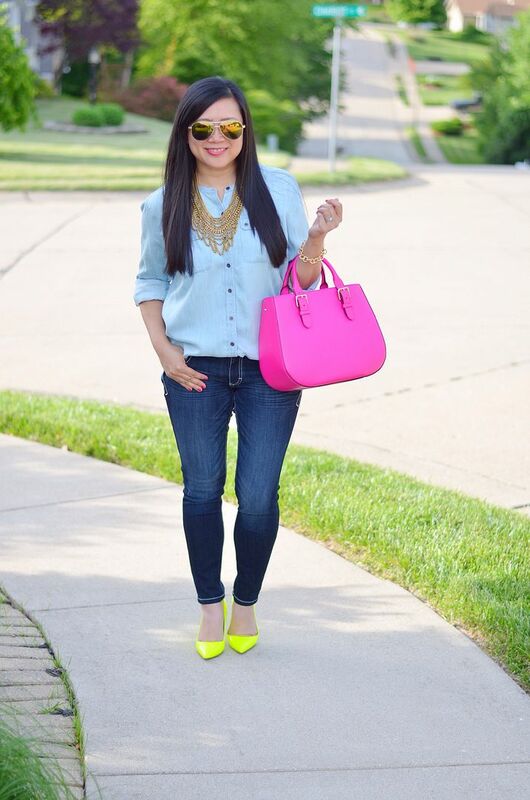 Love Neon and I have always love your yellow pumps!!! GORGEOUS heels and bag!! You look incredible!! I love wearing neon in my accessories! Those pumps are so fun with the bag and simple outfit! My gawd I love those pumps! Fun to see all the ways you've worn them, including one of my all-time favorites (the dress!) I just got a chain necklace yesterday (I was doing a return so it doesn't count as shopping...) and I can't wait to wear it! It's not a bib style but those definitely influenced my need for this! I love how you've styled this outfit. You've managed to bring neon into the mix in such a tasteful, not overwhelming way! Those shoes are crazy versatile! Love them! Love those shoes! They have been on my wish list! Those shoes have been on my wishlist forever - they are SO pretty! They this outfit is amazing - Love neons! Neon colors are such a statement piece! I love bold colors so much and I will feature this look of yours on my blog at http://colorandgrace.com next Friday, 6/5. I run a daily theme and that day was called They Got It Right. Thank you very much for sharing with us and have a great weekend! Looks awesome, wish I could pull it off like you! Thank you so much for sharing at Thursday Favorite Things Blog Hop!